The A Safe and Healthful Workplace in Tennessee is the Law! is a job safety law poster by the Tennessee Department Of Labor and Workforce Development. This is a mandatory posting for all employers in Tennessee, and businesses who fail to comply may be subject to fines or sanctions. This poster must be posted in a conspicuous place by all employers so that all employees can see it. This poster describes the right that employees have to a safe workplace, how to request an inspection, how an employee can file a safety and health complaint, what employers must do to keep the workplace safe for employees and the right for employees to copies of their medical records to show that they were exposed to toxic and harmful substances or conditions while working for an employer. It appears you don't have a PDF plugin for this browser. 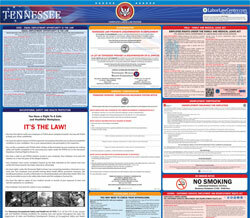 Please see the link below to download tennessee-tosha-poster-legal-size.pdf. •		You	have	the	right	to	notify	your	employer	or	TOSHA	about	workplace	hazards. You	may	ask	TOSHA	to	keep	your	name	confidential. representative	may	participate	in	the	inspection. under	the	TOSHA	Act	or	the	Tennessee	Hazardous	Chemical	Right-to-Know	Act. employer	must	post	the	citations	at	or	near	the	place	of	the	alleged	violation. citation	and	must	certify	that	these	hazards	have	been	reduced	or	eliminated. access	to	the	safety	data	sheets	and	the	workplace	chemical	list. exposure	to	toxic	and	harmful	substances	or	conditions. •		Your	employer	must	post	this	notice	in	your	workplace. or	seek	TOSHA	advice,	assistance	or	information,	call	800-249-8510	or	your	nearest	TOSHA	office. or	obtain	information	on	Federal	OSHA	and	other	state	programs,	visit	OSHA’s	website	at	www. osha.gov. For	additional	information	on	TOSHA	visit	www. http://tn.gov/workforce/section/tosha.